Orthodontics, commonly known as braces, has been revolutionized to help a lot of people improve the appearance of crooked, crowded, or misaligned teeth without being self conscious. Clear, almost invisible braces are changing the life of adults and teens around the world. People are much more self-conscious about their smiles if they are not happy with the way their teeth look. For anyone who is sensitive about their smile, metal braces can be even more damaging to their self-confidence, and ultimately affect the ways in which they interact with others. 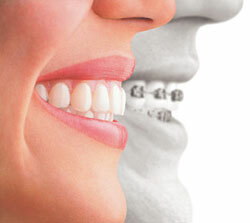 In addition, straightening your teeth with metal braces requires many adjustments to reach perfect alignment. Brackets can come off ; the metal and wires can poke your mouth, tongue, and cheeks, making it uncomfortable for you. Furthermore, according to recent surveys, more than half of teens believe that metal braces would make them more self-conscious, while one in two teens say they would smile less often with metal braces. This goes for adults too. 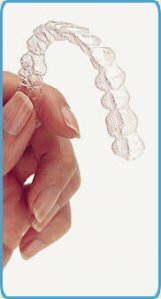 Invisalign aligners are truly invisible throughout the entire treatment. They are gentle to your skin, smooth and can be easily removed for eating and cleaning. Treatment can start as early as ages 12 or 13, depending on the stage adult teeth have grown in. Invisalign is much less traumatic than metal braces but just as impressive. Isabel, an outstanding music theater singer and recording artist needed to make sure that perfecting her smile would not affect her singing voice. After consulting with her, we decided not to opt for veneers, but to use Invisalign. With Invisalign, Isabel would come to us every couple of weeks, as each aligner was replaced with a new one. This repeated process is what is responsible for a small incremental movement. So, for Isabel's needs, we were able to customize each aligner for extremely small, fine-tuned alignments. This would give Isabel a chance to try the new position out, to evaluate the results, and to see if there were any untoward effects. This proved to be the perfect scenario for Isabel -- she was able to gauge her progress and whether it affected her singing. As planned, her teeth were perfectly realigned in about eight months, with absolutely no effect on her beautiful voice.